NXPowerLite for File Servers can be configured to watch specified hot folders and automatically compress any incoming files. It's an easy way to make sure large documents and images are compressed quickly before they can create problems. NXPowerLite for File Servers runs as a Windows service to ensure it is always available. Files will be reduced using our unique compression engine that doesn't change their format. NXPowerLite compresses each file and copies it back over the original. No additional files are created and the originals aren't moved. Add as many watched folders and process as many files as you want so all your workflows can be covered. 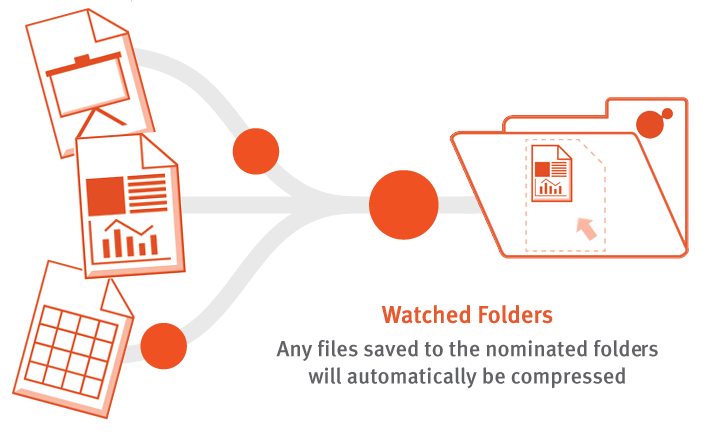 All files saved to a watched folder will be compressed without the need for user input. NXPowerLite for File Servers is available with a simple flat subscription - no per page or variable charges. Watched Folders is a feature of NXPowerLite for File Servers. Visit the main product page to learn about the full NXPowerLite solution, pricing and evaluation options.